As a home-school mom, I’m constantly on the look out for educational resources to supplement what we are doing or to just change things up when needed. A site I happened to learn about this month that I’m finding to be a huge asset is SchoolhouseTeachers.com! I’m so glad to be sharing my review on the yearly subscription! I’ve only just started my subscription this month and I’m very impressed with all the features included. I don’t have to purchase separate memberships for each of my children to use the site. One reasonable affordable fee for everything is extremely appealing when you are on a tight budget! While easily navigating the site on my PC, I learned that The Schoolhouse Teachers share content daily, weekly, or on a monthly basis offering well over 100 courses! I got pretty excited to see that there were lesson plans and units that are geared to the current season or upcoming holidays! These courses will be saving me time having everything I pretty much need in one place! Members are offered a plethora of resources for Pre-k all the way through Highschool. They don’t forget Mom either as there’s several different planners than can be printed out. I know in the next few weeks I’ll be printing out a planner for our 2015 year. The course subjects are listed as supplement, full semester, or a full year or more! I liked seeing that many feature audio and video appealing to visual learners. Each subject is separated into grade categories making it easy to navigate what courses you may want to use. If you tend to favor a specific teaching style they have course that are geared toward Traditional, Classical, and Charlotte Mason style. Most I found to be christian-based and as a believer appreciate that I can enforce my families beliefs into our studies. Once you’ve clicked to see a specific class, there’s a brief run down what to expect and a bio to be read of the teacher who created it. The lessons can be printed and saved in PDF form. I noticed that classes after awhile will be archived but still left up on the site for download. Also these classes aren’t live so you can begin them at anytime which is super convenient if something all of a sudden comes up. How Are We Using or Planning on Using SchoolhouseTeachers.com? My daughter is 6 1/2 year old and my son will be 4 next month. Their ages are reasonably close so we tend to do many subjects together especially when it comes to science, nature studies, educational games, geography, and history. I’ve been navigating the Pre-K/Elementary section of the site. This area has a world of resources. I’ve been weighing all the options and deciding what I’d like my kids to learn in the upcoming months. The great thing is that if I want to chose many courses or fewer I can. It’s all up to me in scheduling the time we want to spend on it. The Science lessons we been doing as a family. Though we’ve been taking a break from school during the month of December, we haven’t gone completely without. In fact, through the Weekly Science Experiments with Jason Lindsey of Hooked on Science, we found several that perked my kids interests to do! Each of the experiments in this course lists science safety, ingredients needed, step-by-step instructions, and end with a scientific explanation. We’ll be doing many more projects from in this area after successfully conducting the Naked Egg experiment. Kids ages 4 & up could do these lessons! I have a lot to choose from for my son Owen! There’s the Animated books by EZ Tales, coloring sheets, stories, games, and many hands-on activities. He’s really enjoying learning and I like that I can find many supplements to use for him while I’m working solely with his older sister. The animated books have been his favorite right now, he’s completely engaged and loves that he can click on nearly everything on each page. I can tell it’s helping him with sight word recognition, memorization, and his computer skills! The “Schoolhouse Dailies” section that offers lessons for every day is a total favorite of mine. There’s copy-work, games, spelling literature, geography, grammar, art and much more for all grade levels. This is a great section if you want to include core subjects in daily doses! It’s real treasure trove of resources for children ages 3 through highschool. One area that stood out to me under the “Dailies” were the courses in the Ditch the Desk section. These last couple of weeks, I’ve been using lots of the Holiday themed lessons such as the History of the Christmas Tree and Candy Cane from the Dailies! These particular courses had actives for both older and younger kids. My children loved the hands-on-activities. We ended up making salt-dough ornaments to decorate our own Christmas Tree like done in days of old and incorporating The Legend of the Candy Cane story into our literature studies! Next month, I’m taking advantage of The Literature Kits! These focus on a different book each month and offer hands-on activities, history, geography, science, Bible, language arts, recipes, and more pertaining to each book. We’ll be starting The Lion,the Witch, and the Wardrobe by author C.S Lewis. My daughter is very excited about our future literature lessons. Others currently archived that we’ll be going through include classics such as Charlotte’s Web! I plan on doing many more courses over the span of the year from SchoolhouseTeachers.com and certainly will be sharing our journey. Above is just a glimpse of how I have been using the courses and of those that I plan on starting soon. I can’t recommend this site enough. I have a feeling our 2015 school year is going to be pretty amazing! Cost? A Yearly Subscription to SchoolhouseTeachers.com is $139.00 per year saving you 10% of what a membership would be per month at $12.95. It’s an amazing resource that will save you time, money, and more! 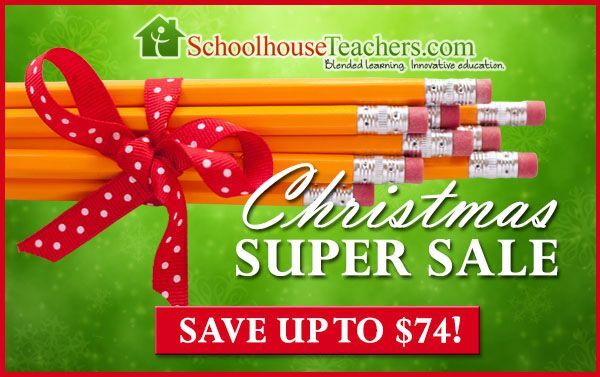 SchoolhouseTeachers.com is having a huge sale right now and through Christmas Day at 11:59pm ET. 40% off the monthly membership ($7.77/month) or 50% off the Yearly Membership ($64.26/year). Homeschool families who join at this rate will keep it forever as long as they maintain a continuous membership. Click the image below to take advantage of this offer!